The Dallas Cowboys christened their new stadium Friday night against the Tennessee Titans. I had a chance to try out the billion-dollar complex for myself, 19 rows from the 20 yard line. Even though it was only a preseason game, about 75,000 people came out for the event. The atmosphere felt like a mid-season NFL game complete with tailgate parties and people painted blue. If you want to paint yourself blue, I’m not going to judge. But to help keep you from feeling blue on your first visit to cowboy stadium, here are some things you should know before you go. Prepare to be impressed with what a billion dollars can buy. Expansive space with lots of glass and a capacity of 100,000 under the largest single span dome in the world. The view from inside is so massive it feels fake. Before the game, they showed a video demonstrating how the Statue of Liberty, the St. Louis Arch, and the Empire State Building can all fit inside the stadium with room to spare. Despite the grand scale, there’s really not a bad seat in the house – even on the 4th tier section that takes the term “nose bleeds” to new heights. Seriously, if you’re afraid of heights you might want pass up on the top section. Tickets prices aren’t for the faint of heart, either. 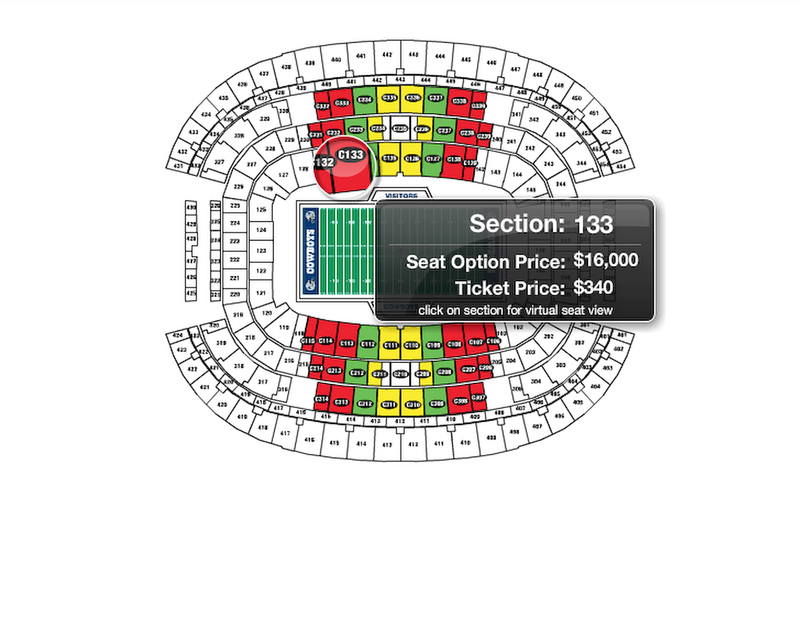 The image above shows our seats for the pre-season game versus the Titans and the price tag. Yes, you read that right. Since your seats are such and investment, you’ll want to check out the stadium’s interactive seating charts. Click on a section, and you can check out the virtual view from your seat. For example, to see where I sat, click here, then click on section C133 on the map. Traffic flow is well laid out and handled the thousands of cars with minimal waiting during my visit. Still, if you ever have a chance to go, do yourself a favor and visit the special map website dedicated to helping you plan your route to the stadium. Simply enter your ZIP code, and it gives you the best route based on real-time traffic and construction info. It’s bad enough when Romo gets called for a delay of game…you don’t want to be slapped with a delay to the game. Parking near the stadium is expensive. As you can see from this parking map, lots surrounding the stadium complex are divided into two tiers: Blue and Silver. Most if not all the Blue and Silver lots require a pre-paid parking pass with prices running from $70 – $120. Some of the Ranger Stadium cash lots are open before the game for $50. If you’re running low on funds after your ticket purchase, or you’re wanting to save up for a hotdog at the game (see below), you can find some private parking areas for half the price. You’ll just have to walk a bit. Along Division Street, we found a sweet deal for $25. If you want the scoop on that, I can hook you up. Heads up — there are strict rules for what kind of cameras you can take to a cowboy’s game in the new facility. No video cameras of any kind are allowed. Still cameras that don’t have detachable lenses are also permitted. In other words, fancy SLR-type rigs are a no-no. If you can take the lens off the camera body, you’ll want to leave it at home. There aren’t any storage lockers at the stadium, so if you try to sneak a camera past security and they get wise to your shenanigans, you’ll be hoofing it back to the car. Yes, your ticket was expensive, but it’s not the last time Jerry will sing “Ka-ching” as you open your billfold. Concessions aren’t cheap. My hotdog and pepsi were $10.50. That’s the budget route. Expect to drop nearly 10 bucks for nachos, a bar-b-que sandwich, or a beer. The up side is that club section seats have their own limited access concession stands that drastically reduce lines. And the pro shop… Really? You didn’t just ask that, did you? 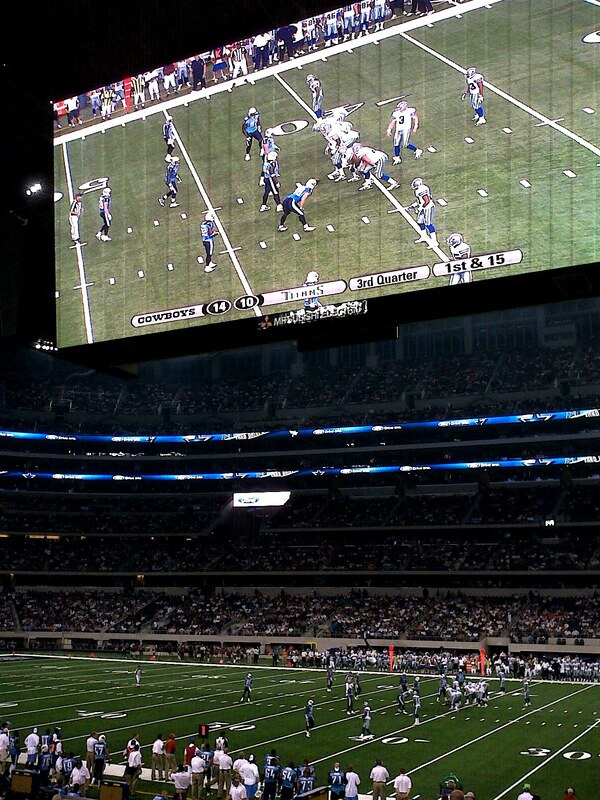 One of the reasons there’s not a bad seat in the house are the twin 60-yard-long HD TVs mounted above the playing field. Yes, that’s right 60 yards long, making them the largest HD TVs in the world. Even from the upper levels, you feel like you’re a part of the action. The image on the screens is so sharp that you find yourself spending more time looking at the screens than at the field of play – even from the very best seats in the stadium. If you’re in the lower sections, you’ll find the screens so low that they’re dipping into your field of view. At our experience with the inaugural game, the screens were too low, in fact. A Titan’s punter hit the bottom of the displays during the game, forcing a do-over. Look for the screens to be raised several feet in the future. Because the TVs are so impressive, you’ll want to avoid end cap seats so you can take in the all the HD goodness. The TVs dominate the viewing experience – and also present a catch 22. It’s kind of ironic but, if you were going to spring for 4 good seats, a good parking space, and food for the crew you might consider going out and getting yourself a big TV and throwing your own party instead. This entry was posted in travel, video. 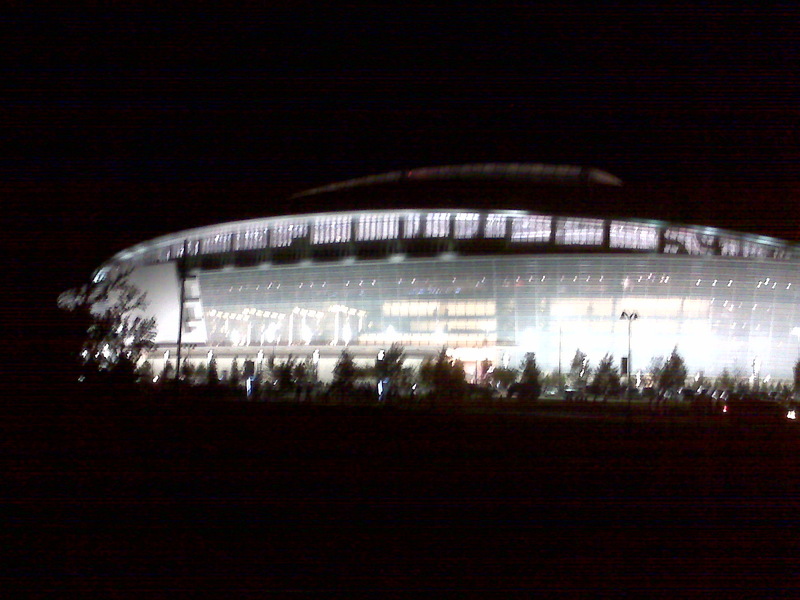 Tagged cowboy stadium, cowboys, dallas, GoWild, jason witten, review, texas, tickets, travel. Previous Post Previous post: Can you help identify this mystery chief?